Petunias are the most popular inhabitants of flower beds, vases, balconies and windows. Beautiful flowers of various coloring can be grown in various weather conditions won fame to this plant around the world, he can be met on all continents, except Antarctica. 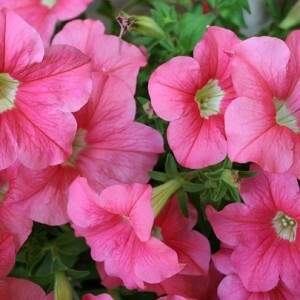 Though Petunia isn't grown up as a houseplant, but not to find the best flower for decoration of balconies and windows! The petunia, or Petunya (Petunia) – a sort of grassy or semi-shrubby perennial plants of the family of Solanaceae, according to various data, totals from 15 to 40 types. Petunia's homeland – South America, the first view from a sort it was found in Uruguay in 1793, Lamarck carried it to a sort Tabakov and called Nicotiana axillaries. "Petun" in translation from Portuguese also means "tobacco", Petunia's leaves and tobacco are really very similar. Petunia's hybrids which appeared already many years ago generally get divorced as one-year garden or balcony ornamental plants. In honor of this beautiful flower even the asteroid opened in 1921 is called. Petunia. Petunia cultivation. Garden encyclopedia.